'Light at the End of the Tunnel' was a masterplan, launched in 2002, to deal with the 6 miles of railway viaduct with nearly 1000 arches in South London. Transforming the environment from intimidating spaces into bright, safe passageways and innovatively renovated arches. This two part walk looks at some of the projects that have been undertaken. Part 1 begins at Vauxhall Station at finishes near Waterloo Station at York Road (2¼ miles). From here take bus 381 to Blackfriars Road where part 2 begins. This finshes at the Royal Festival Hall (1¼ miles). Some sites feature on other walks. Begin at Vauxhall National Rail Station (opposite bus station). Follow signs from the tube station. Go right under the railway arches. These are lined with artwork panels designed by local community groups. They refer to the heritage aspects of Vauxhall, including the nearby Pleasure Gardens. Cross the main road and walk northwards through Spring Gardens. New Spring Gardens first opened in 1661 and were initially free. When Jonathan Tyers took over in 1728 he added buildings and structural features and provided entertainment. The new Vauxhall Pleasure Gardens levied an admission charge but they were patronised by high society. After Tyers death in 1767 they remained in the family and fireworks, ballooon ascents and tightrope walking events were staged. The gardens were sold to new owners in 1821 but from the 1840s there followed a period of closures and sales. They finally closed in 1859 following the building of the railway between Nine Elms & Waterloo and the rival Crystal Palace at Sydenham. The area was built over with housing, later cleared following bomb damage. Bear left and cross Goding Street into New Spring Gardens Walk. Go right along the Albert Embankment. Cafes under the viaduct offer outside seating. Notice the artwork on the arch. At the end of the street are the former premises of Horatio Myer (brass bedsteads). Left along Vauxhall Walk and left at Randall Row. Walk through Pedlar's Park. This commemorates the Pedlar who was said to have bequeathed land to the church (known as Pedlar's Acre) which became the site of County Hall. He and his dog are depicted in a stained glass window at the Garden Museum (former St Mary's Church). The arches are decorated with themed mosaics (the central one on the north side explains). Go right at the end of the street. On the left is White Hart Dock (see plaque). Right at Black Prince Road. On the left are the former premises of Doultons who worked on this site from 1815 to 1956. Raw materials would have been off-loaded at the riverfront dock. The 1876 building is now a business centre. The railway arches are decorated with themed mosaics (the central one on the north side explains). The path alongside the railway has been upgraded through an open space linking with Pedlar's Park. Beaconsfield was established in 1995 as a contemporary art gallery in what was once the Lambeth Ragged School. Their railway arch space is available for hire. Left at Whitgift Street then right through Lambeth Recreation Ground. The land was originally granted to the parish by Archbishop Thomas Tenison of Canterbury for a burial ground. It was extended in 1816 but after becoming full was closed in 1853. By 1880 it was 'very unsightly' and the vestry decided to turn it into a public garden which was completed in 1884. Gravestones were moved to boundary walls with the mortuary left standing. The new garden was conveyed to Lambeth Vestry and then to Lambeth Borough Council. In 1929 it was enlarged when the site of a glass bottle factory in Whitgift Street was purchased for £700 and in the late 1970s was re-landscaped. 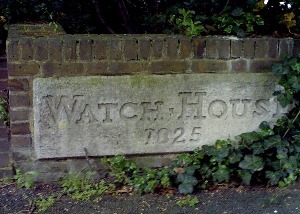 A watch house for holding 'the drunk and disorderly' in 1825 was originally left but is now gone its site marked with a stone [pix]. Go right along the High Street then right at Lambeth Road. The Garden Museum occupies the redundant St Mary's Church. Further along is an entrance to Archbishop's Park. Right at Pratt Walk, left at Juxon Street then left along Sail Street. Businesses occupy new units along here. Spacia has constructed new light industrial and storage premises within the arches. The tunnel is decorated with mosaics based on Blake's epic poem 'Innocence and Experience'. There are more Blake mosaics. Number one won RIBA's London Building of the Year 2003. Flats have replaced Georgian houses which included the home of William Blake in the 1790s (blue plaque). There are early 19th century cottages opposite. Christchurch & Upton Chapel stands on the site of a female orphanage founded 1758. The 'stars & stripes' pattern on the spire commemorates donations received from America to build the church in 1873. It was destroyed by bombing in 1940 but the tower was retained in the new chapel and office development. Lambeth North Station features ox-blood tiles. Opposite is the Crown & Cushion pub on the site of tea gardens and the entrance to the former London Necropolis Station. This special railway service moved from York Road in 1900 and carried coffins and mourners to Brookwood Cemetery in Surrey until WWII when the premises were bombed. Right at Lower Marsh then left at Leake Street. Cross York Street to 381 bus stop or go right to access Waterloo Station. On the south side is Poured Lines by Peckham resident Ian Davenport. At 50m X 3m it is the largest outdoor painting in the country. The enamelled panel (unveiled in 2006) incorporates over 300 colours and took two years to create. Two arches are decorated with LED light installations featuring their ID numbers. Left along Chancel Street then right into Gambia Street. This was transformed from a road to a garden space in 2003/4. Right along Scoresby Street then left at Blackfriars Road. The ticket office of the original Blackfriars Station has been renovated for commercial use in conjunction with Railway Heritage Trust. Go between the tube station and the railway opposite continuing into Isabella Street. This is now lined with cafes with outside seating. Left along Hatfields and right at The Cut. Streetscape improvements have been undertaken here. Right at Greet Street then left along Wootton Street. 18 new units with mezzanine floors have been created under the arches for businesses, a gym and a cafe. The Waterloo East Theatre is located at the end. Right at Cornwall Road then left along Alaska Street. Notice the curious side window of Enis's Cafe. Cross Waterloo Road and go right. Take the second left (access to station). Right at Mepham Street. The Hole in the Wall pub occupies an arch. This is decorated with two mosaic panels. Go left and cross York Road into Concert Hall Approach. Sutton Walk to the left has an illuminated panel replicating the original wall and a lighting installation. The next arches house the Fredrick Topolski 'Memoir of a Century'. This 600' long mural depicts the major political and world events of the 20th century and the personalities who fashioned them. It was donated to the nation by the artist in 1984. Further along is the aptly named Archduke Restaurant. Shops have been constructed against the viaduct.